Fire up the grill and throw on a burger. For many, outdoor summer dining is a summer staple. As millions of backyard chefs peer over the grill and ponder whether the meat is done, perhaps they should be wondering if the meat is, in fact, too done. Mounting research suggests a link between eating grilled meats, especially those that are well done, and the risk for some types of cancer, including breast and colorectal. What harmful substances are found in Grilled Meats? Two classes of carcinogens, or cancer causing substances, can be found in high concentrations in grilled meats. 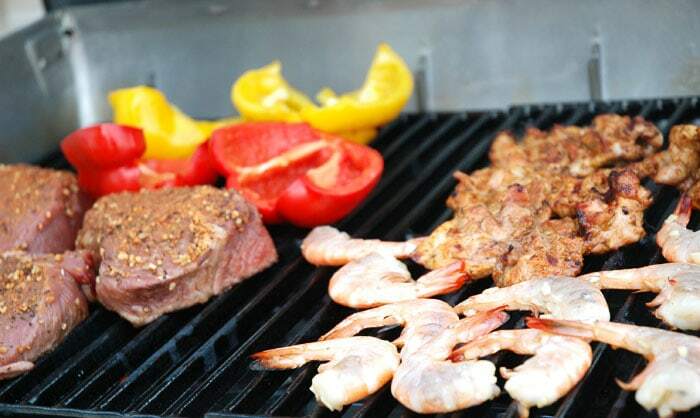 Heterocyclic amines (HCAs) are formed when muscle meats, including beef, pork, poultry and fish, are cooked at a high temperature, as they are when grilled. Another class of carcinogens, polycyclic aromatic hydrocarbons (PAHs), are formed on the surface of meats by smoke and flame flares which occur when fat and juices drip down onto the heat source below. Since carcinogens continue to build as meat stays on the grill, take measures to reduce meat’s time under the hood. This means removing meat before it’s well done. Another solution is to start the cooking process in the microwave, then finish on the grill. To reduce grill flare ups, choose lean cuts of meat, and trim any visible fat before tossing onto the grill. Marinate your meats. Besides adding flavorful flair to meats, a study published in the Journal of Food Science in July 2008 found that marinating reduces the build up of HCAs. Food Science Professor Dr J. S. Smith of Kansas State University found that marinades with herbs (such as thyme, rosemary, oregano, basil, and garlic) appear to be most effective in lowering the formation of HCAs. Since carcinogens are concentrated in charred portions of meats, trim and discard those pieces before eating or better yet, cook meat until it’s done, but not blackened. Fill your plate with fresh fruits and veggies (steer clear of heavily dressed sides like macaroni and potato salad, which are high in calories and fat), and leave about 1/4 of your plate for the grilled meat. Not only will you control calories and fill up on a healthy dose of fiber, vitamins, and minerals, but by keeping the meat portion small, you also reduce your carcinogen exposure. As an alternative to meats, vegetable-derived protein sources like veggie burgers and dogs are excellent grillers since they don’t produce the same level of carcinogens as grilled meats (they have very low amounts of HCAs when cooked, and sometimes none at all). Have fun trying something new! You don’t need to throw the cover over your grill and push it into a back corner of the deck to keep yourself healthy. With a few modifications, you can enjoy the pleasures of summertime grilling. Who knows? You just might surprise yourself and find that a fresh ear of grilled sweet corn and a juicy grilled peach trump the burger anyway. While there is enough evidence to support limiting your intake of grilled meats in order to avoid consuming carcinogens, there is not yet conclusive evidence that specifies exactly how much is safe to eat. If you simply can’t part with your grilled burger, your best bet is to choose lean cuts in small portions and pass on very well done, charred selections. To reduce the amount of grilled meat you eat, build your meals around grilled vegetables and fruits.